A quick view of the most influential metrics in Carmel Mountain. The communities or neighborhoods of Carmel Mountain Ranch and Sabre Springs are located in the northeastern part of the city of San Diego, located in San Diego county, California. Carmel Mountain Ranch is also known simply as Carmel Mountain or CMR for short, it spans 2.337 square miles and is home to approximately 12,000 residents. Sabre Springs spans 2.483 square miles and is home to approximately 2,500 residents. Though their population geographic sizes are similar, the population of Carmel Mountain Ranch is approximately 3,988 people per square mile which far outsizes that of Sabre Springs, which has a population density of only 1,025 people per square mile and the local boyscout troop, pack 624, serves both communities and is located Carmel Mountain Ranch. Carmel Mountain Ranch is a primarily residential community and features parkland and golf courses that give it a rural feeling, despite its population density. The community has local bus routes and managed express lanes that simply commuting to other parts of the city of San Diego. Special events in the community include a fall art festival, the CMR Olympics, and Holiday Magic at Fairway Village. The community is known for its shopping centers, like The Courtyard at Carmel Mountain, Price Plaza, and the Carmel Mountain Ranch Town Center. Sabre Springs was built as a master-planned community and features a number of walking paths, open green spaces and several golf courses. The community was built beginning in the 1980s and was mostly built-out by 2010. The business park in Sabre Springs is made up of various businesses like General Atomics, Hospira and Bridgepoint Education, AAA Automobile Club of Southern California, Intel and others. The community is blessed several parks including Sabre Springs Park, South Creek Park and others. There are two trails that run throughout the community designed for walking, biking and jogging. This master-planned community features luxury living for residents of all ages, including Belmont Village a lavish assisted living environment for seniors. The communities rely on the award-winning Poway Unified School District to educate their children and build a greater sense of community with youth sports activities, a combined boy scout troop and more. The housing in these communities are largely upper middle-class through luxury living properties and range from single family homes, to apartments, condominiums, town houses and senior living facilities. These homes are nestled along quiet streets among parks and employment opportunities. Contact local real estate agents for assistance in exploring the wonderful communities of Carmel Mountain Ranch and Sabre Springs and find your new home. View our selection of available properties in the Carmel Mountain area. Check out the latest demographic information available for Carmel Mountain. Learn more about schools near Carmel Mountain complete with ratings and contact information. 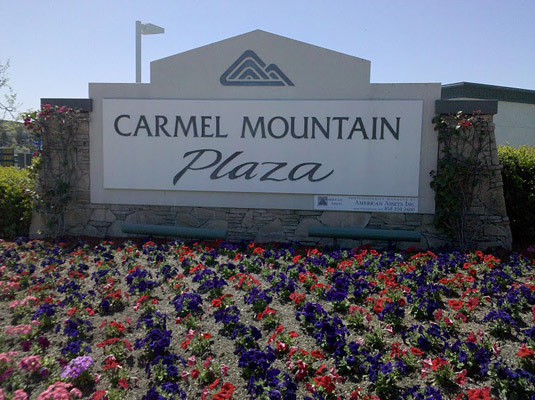 Browse through the top rated businesses in the most popular categories Carmel Mountain has to offer.